The assembly of a Trump administration in Washington, D.C. could send a ripple through the political waters in Texas, particularly if the president-elect hires from within the state's congressional delegation. Editor's note: If you'd like an email notice whenever we publish Ross Ramsey's column, click here. This column has been updated and corrected. Speculation thrives during the seasonal shift from elections to governing, a period marked by the score-settling, kissing and making up dictated by election results and the groveling, scheming and power-grabbing that precedes the formation of a new government. Everybody in politics is kissing someone, or something. It’s not just speculation about the next federal government. What happens there affects things in Texas, and in Texas, the speculation games are well underway. Who gets the jobs of the people who get new jobs in Washington? That list includes a lot of people. The currently jobless Rick Perry has been mentioned for a number of Cabinet appointments, including Secretary of Energy, the agency he was trying to think of abolishing when he unintentionally made “Oops” his 2012 campaign slogan. That’s fun to talk about, but it doesn’t require any heavy thinking here in Texas. 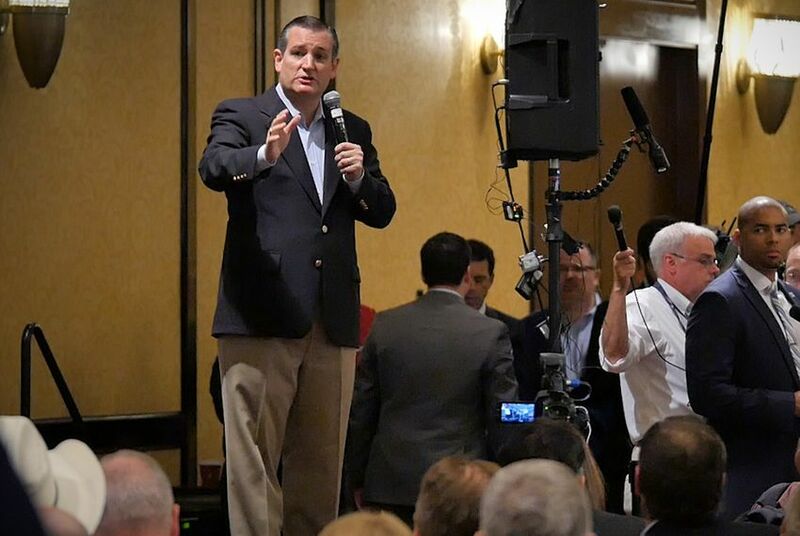 Ted Cruz, on the other hand, would have to give up a seat in the U.S. Senate if he has convinced the incoming team that he didn’t really mean it when he called Donald Trump a “pathological liar,” “a serial philanderer” and a bunch of other nasty stuff back in May. He’s come around. He endorsed Trump before the election. He talked with the president-elect earlier this week. And even though nobody outside the room knows whether they were comparing Pokémon collections or talking over jobs in the new administration, the political world is atwitter with the possibility of an Attorney General Cruz, or perhaps, something else (Trump reportedly offered the AG post to Alabama Sen. Jeff Sessions). Texas Agriculture Commissioner Sid Miller, a Trump stalwart, has been mentioned as a possible Cabinet member. To get there, he and his masters would have to endure Senate confirmation hearings that would include a trip through Miller’s political photo album: Jesus shots, a Twitter account that would make a Trump blush and whether his “grandbabies” will grow up in a socialist or a Muslim country. It’s survivable, perhaps, but is that a good way to launch a new administration? If it is, you can start the speculation machine on who should get Miller’s job in Texas. See how this works? This is the early part, where names are tossed into the conversation — a conversation that, for the participants, has to feel like jumping into a snow blower — with the aim of finding out who might survive public scrutiny. Cruz’s job is clearly the plum, but U.S. Reps. Michael McCaul of Austin and Jeb Hensarling of Dallas are also in the snow blower, no doubt inspiring the dreams and ambitions of ambitious politicos in their home districts. When Bill Clinton tapped U.S. Sen. Lloyd Bentsen of Texas to be treasury secretary, it triggered a series of events that could recur now. Then-Gov. Ann Richards was suddenly very popular with other Texas Democrats who were all hoping to be Richard’s appointee to fill the job until a special election. Former San Antonio Mayor Henry Cisneros and then-state Comptroller John Sharp made strong plays for the gig. But Richards went with Bob Krueger, a former congressman. That gave him a jump of sorts: In what turned out to be a special-election field of two dozen candidates, he was the only prominent Democrat. He finished 99 votes ahead of state Treasurer Kay Bailey Hutchison, who then clobbered him two-to-one in a runoff. Despite that fate, if Cruz gets a new job, every Republican in Texas is going to want to be this year’s version of Krueger, vying for an appointment from Gov. Greg Abbott in advance of a special election. It would give someone the jump on other Republicans in a state where Republicans completely dominate. The same would happen on a smaller scale if Trump tapped a member of the congressional delegation, but without the gubernatorial appointment: a special election, followed, potentially, by a long term in Congress. It could put the governor in charge of a lot of big jobs — real, if temporary, positions of power. It could make the career or careers of the winners. It could rejigger the power structure of Republican politics in Texas, particularly if it involves a Senate seat. Or it might all die in the snow blower. It’s only speculation. Editor's note: An earlier version incorrectly said the governor would temporarily appoint someone to fill an empty congressional seat; in fact, a House seat would remain open until filled in a special election. Winning isn't everything when it comes to party control. If it was, Texas lawmakers would have nothing to do. But they still have plenty to fight about, and Republicans in Washington, D.C., will, too. It won't change the color of the leaves on the trees, but the civics seasons in Texas have changed. Say goodbye to the elections and hello to the legislative session.